A medium size handmade fabric wallet to hold and protect your passports and other travel related documents in one single location. This would be a great accessory for keeping your family's travel documents safe, secure and handy while on holiday or just to keep your documents organised while at home. 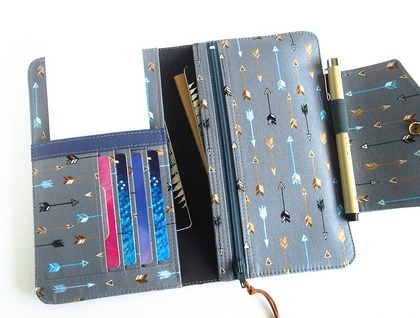 Wallet is firm but pliable due to the special stabiliser used in between the layers. 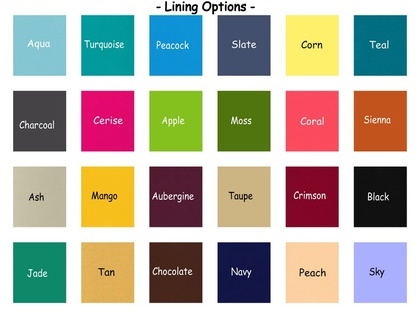 You can choose from an option of lining colours as seen in the last photo. Please message me with your choice. ● Up to 8 credit or debit cards. ● Two (2) larger pockets for passports, small journal or folded papers. 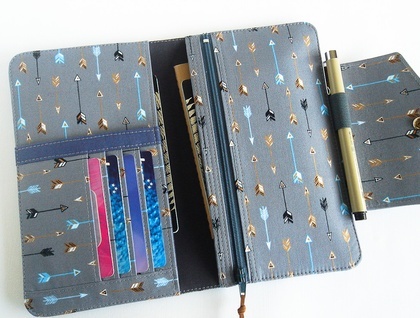 ● A large zippered compartment for keeping currency, coins, keys or other small valuables. ● A 12 cm (4.75 inches) deep sleeve on the left which can hold a passport, small Moleskine journal, boarding passes or a phone. ● Four (4) credit card slots which will hold 1-2 credit/loyalty cards in each slot. ● Large envelope style tab to keep passport wallet contents safe and secure. ● Great structure, form and stability. Wallet will hold its shape even while empty. 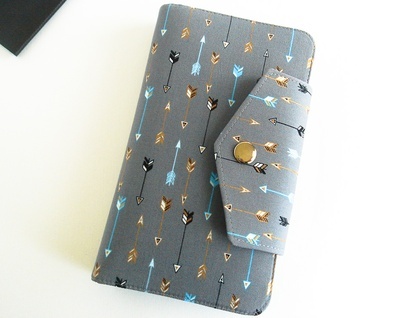 ● 100% cotton fabric in Arrows print for the exterior, card slots and zipper compartment. ● Solid cotton in your choice of lining colour for base lining. ● Imported premium ultra firm stabiliser incorporated to make for a firm but pliable travel wallet, giving the travel wallet a leather-like feel. ● Width 12 cm (4.75 inches) when closed. ● I recommend spot cleaning using a mild detergent. ● Detailed washing and cleaning instructions will be included with your wallet.